Inside: Five year old girl information. Five year old schedule, dealing with emotions, and homework details. 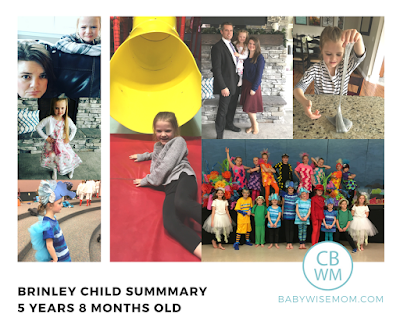 This a summary for Brinley from 5 years 7 months to 5 years 8 months. Sleep was great this past month. She didn’t have any bad dreams at all. Eating is good and pretty non-eventful. We had a spell while on vacation where she “wasn’t hungry” at meal times and then begging for food shortly after the meal was over. We reminded her the time to eat was mealtimes and we didn’t allow the “I’m full” at meals for a bit. We typically are fine with the kids deciding when they are full, but she needed to just eat what was available at the meals so she wasn’t asking for food at other times. We aren’t a “grazing” type anyway, but especially while on vacation and not home with food all around us, it was important for her to eat what she needed at meals. We did of course have snacks while we were out and about, but this was 10-15 minutes later proclaiming she was starving. Brinley was quite the emotional four year old. This is a common age to be emotional; Kaitlyn was the same way, while Brayden and McKenna weren’t extra emotional at that age. Kaitlyn snapped out of it at five. Brinley has eased out of it. She has slowly become less and less emotional over time. I think things have eased up even more in the last month or two. I wonder if she is one with just “big emotions” and might be more emotional than your typical person. Time will tell. Here is a post on helping your child work through emotions. I had a reader request to know more about when the kids do school work at home in the schedules, so I will address it with each child individually. We have half-day Kindergarten around here, so Brinley is able to easily get her homework done after school. Our routine is to get home, eat lunch, and then do homework right away. I don’t like putting homework off until later because I never think of it again. I know some people like to give significant time between getting home and homework time, and I understand their reasoning, but we have always done homework right away for all kids, no matter what grade they are in. Of all of my children right now, Brinley has the most homework. I think that is in part due to the fact that we are a state with half-day Kindergarten in a nation of full-day teaching requirements. So some things simply need to be sent home. It is also largely because my older kids get homework done at school during their down time, and Kindergarteners just don’t have down time–again, half-day issue (by the way, I LOVE half-day Kindy. I am not upset it is half-day in the least). We are able to get homework done well before any other activities need to take place, even on days she has early activities. This is what Brinley is doing outside of school. She is doing more than she will be able to do when she moves to full day next year, just logistically. It gets hard to fit everyone’s things in after school, but right now, I am able to do most of her things while the older kids are at school. Swimming lessons: She had 1-2 this month. She had a little break before that, and her first time going back, she was super nervous. But she did great and was excited after that. We have found Brinley does much better with lessons if no one else is in the building with her. We literally leave her with the teacher. Gymnastics: She really likes gymnastics and is really loving it! She is progressing. She does little tricks at home. I don’t see her ever going anywhere beyond “for fun,” but I see so much value in what it is helping her to do at this point. Dance: dance is great! She loves her dance teachers. We have started talking about what she can and can’t do next year, and right now she is saying she wants to do gymnastics over dance. So she likes it, but likes other things better. Piano: Piano is great. She loves the piano, can read notes well for her age, and can play by ear quite well. A funny thing with the kids is they all want to play more advanced songs (of course). They want to play what Brayden plays. So Brinley literally is picking out by ear his recital song. HA! Musical: The musical ended during this time. She had a lot of fun with it! Brinley loves to read and is getting more into chapter books. I feel like since Brayden was 5, more and more beginner chapter books have come out. Her two favorites right now are Mercy Watson and Princess In Black. I love these chapter book series for new readers. They are short enough that you can easily make it through one book in just a few nights (you could even do one if needed), so they don’t have to follow the storyline for too many days. I like it being broken up over a few days just to train them to remember a storyline and come back to it day after day. They have fun pictures but are a chapter book. 12:30 PM–home and eat lunch. Homework. Then she can watch two 30-minute shows on PBS and has independent playtime if desired. Two days a week she has her extra curricular activities. I scheduled her stuff during the other kids’ school day so we didn’t have our family time so interrupted.